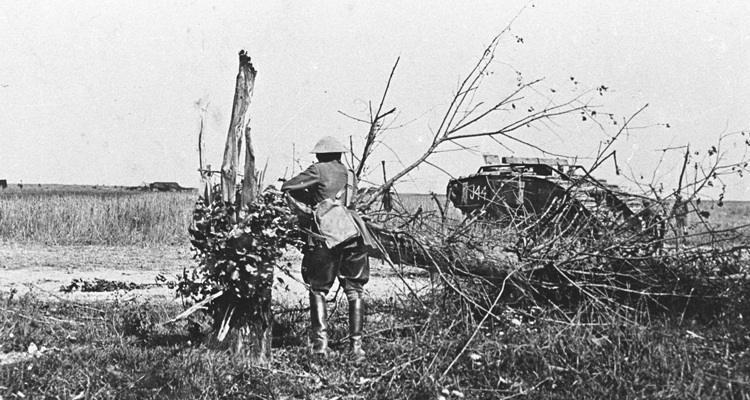 In the vanguard of the assault, almost 400 tanks rolled forward on ideal ground towards the French town of Cambrai. This was the first large tank attack in history and it was devastatingly effective. 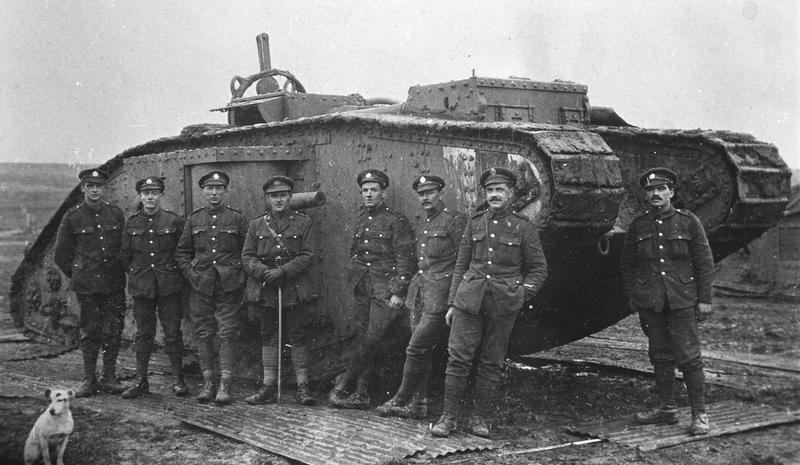 The Tank Mk I had made its debut on the Somme in September 1916. Success was modest, but the supposedly reactionary British Commander-in-Chief, Sir Douglas Haig, showed his faith in its potential when he ordered 1,000 more for 1917. 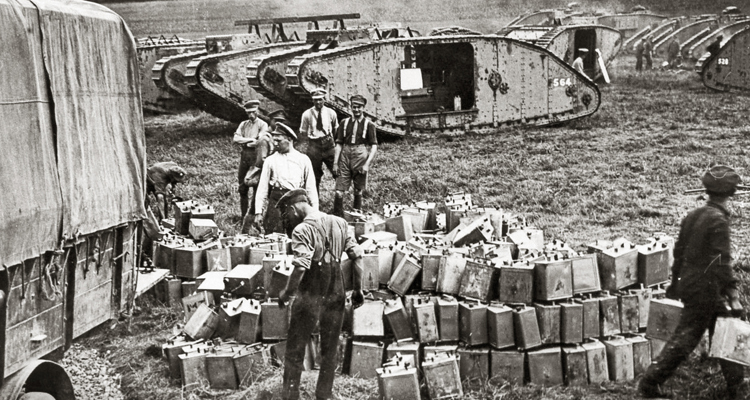 Tanks were deployed in the early battles of 1917, but in smaller numbers and across boggy Flanders mud. Tanks were entirely unsuited to both. 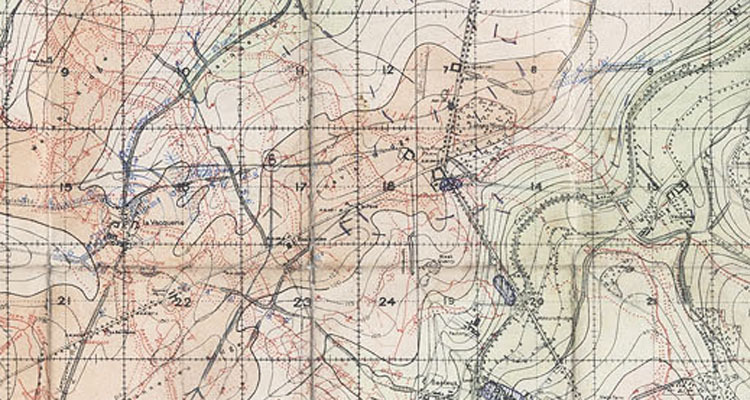 Tank Corps commanders were naturally frustrated at having both their potential and their machines squandered in this way – but Cambrai was the moment they had been waiting for. The new Mk IV was almost identical to the Mk I, but it had thicker armour, an improved fuel supply and modified sponsons. The tank pushed contemporary technology to its limit and as a result the vehicles tended to lack the reliability that might be expected from combat vehicles today. Each tank had a crew of 8 men, tightly packed into metal compartment around an engine that generated unbearable heat and noise. The sound was exacerbated with the thunder of the tracks, weapons and enemy fire striking the armour. An artist’s impression showing Mark IV tanks advancing at Cambrai. At 3mph, it was slow and required half of its crew just to steer it. The atmosphere inside was a choking combination of exhaust fumes, hot oil, petrol, as well as expended cordite from the guns. Without suspension the crew could be thrown about inside, suffering broken bones and concussion. As the cab filled with carbon monoxide, oxygen starvation caused nausea and headaches. It was difficult, dangerous and uncomfortable work. But the early tank crews were unflinching pioneers and like all those who have come after, they never let such problems affect their performance in battle. 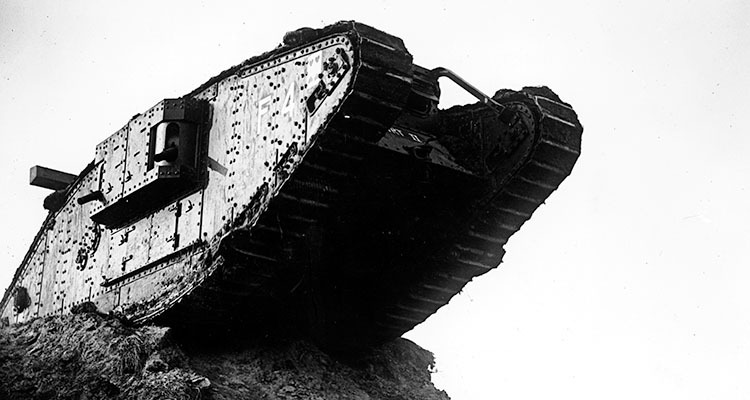 At Cambrai the tank had finally been used for the purpose it was intended; it was a large scale co-ordinated deployment which punched right through the German positions, causing confusion and panic amongst the stunned defenders. 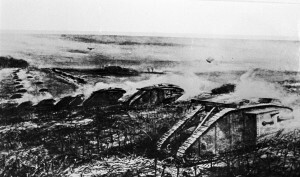 With its crew protected from machine gun fire and supported by new artillery techniques, the tanks pushed across no man’s land, through the otherwise impenetrable mass of barbed wire into the Hindenburg defences, where they proceeded to lay heavy fire down the length of the trenches and roll up the flanks of the penetration. By 4pm the tanks had advanced seven miles, affecting the most rapid advance of the war. To put this in perspective, a similarly sized penetration had taken three months and cost 250,000 casualties. 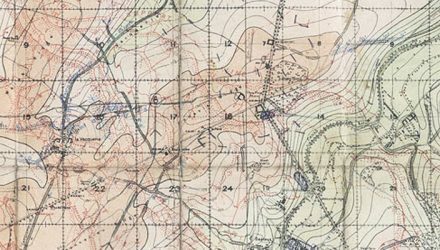 The deadlock of trench warfare was broken; The Tank Corps had swung open the door to the `green fields beyond` and in doing so, sealed their place in history. This was the moment when fresh troops should have poured through the gap. But mobile reserves were not available in sufficient numbers or in time to exploit the situation. Likewise the Cavalry, for whom special routes had been prepared, found it impossible to advance in the face of barbed wire and machine-gun fire so the advance petered out. When the German Army counter-attacked at the end of the month they recaptured much that had been gained and the front reverted to the kind of destructive slogging match that so characterised the Western Front in the First World War. French Minister of Munitions, January 1919. Cambrai Day is marked by historical reflection and celebration every year by the modern Royal Tank Regiment.